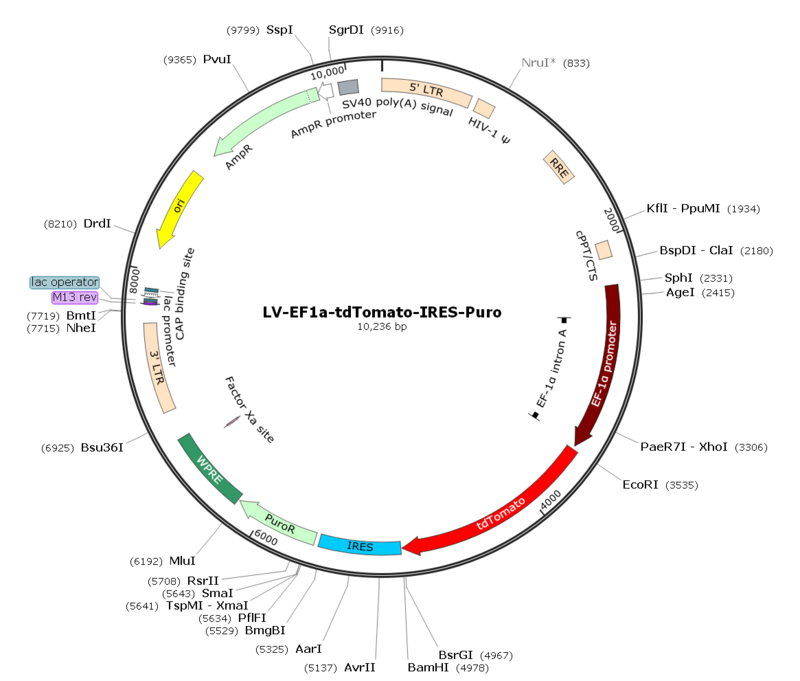 Description: LV-EF1α-tdTOMATO-IRES-Puro is a pre-made lentivirus which expresses tdTOMATO under EF1α promoter with co-expression of puromycin selection via IRES. tdTOMATO, tandem dimeric (pseudo-monomeric) derivative of DsRed, is an exceptionally bright red fluorescent protein with around 6 times brighter than EGFP. Because the two subunits of tdTomato are linked covalently, it behaves as a monomer, and has been used successfully for N- and C- terminal fusions. It shows very low aggregation, excellent photostability and its half-time for maturation is just one hour at 37°C. The red emission and brightness of tdTomato’s make it ideal for both in vitro and in vivo imaging studies.